More senseless gun violence rendered four people shot Thursday evening in a drive-by shooting along the funeral procession route of rapper and community activist, Nipsey Hussle. One of the victims has died. As mourners celebrated the life Hussle, who was also a victim of gun violence, an unknown assailant fired into the crowd from a gray Hyundai shortly after the hearse containing his body had passed. LAPD Chief confirmed the shooting via Twitter, specifying that the victims included three men and one woman - all black - ages ranging from 30 to 50 years old. As of now, none of the victims have been identified and the shooter has not been apprehended. 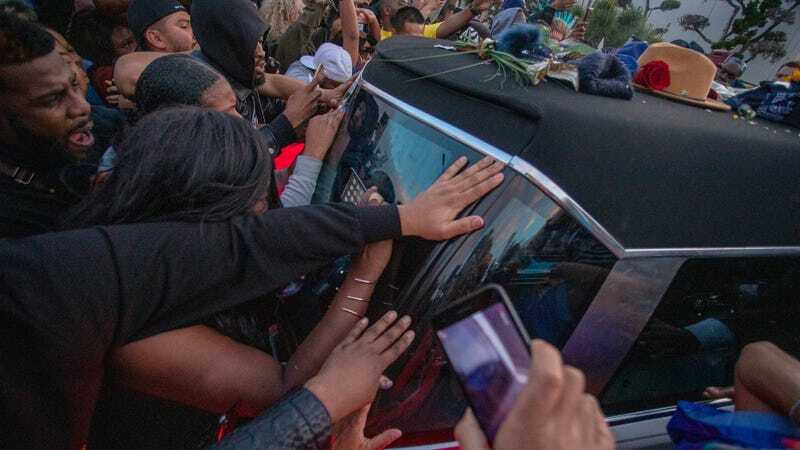 Over 21,000 mourners gathered to pay their last respects to the slain rapper, who was shot outside of his Marathon clothing store on March 31. The sold-out public funeral was held at the Staples Center and was immediately followed by a 25.5 mile-long processional that passed through a number of areas significant to Hussle.